US President Barack Obama has played golf 32 times since he took office, more than his predecessor George W Bush did during his entire presidency. He most recently played on Sunday, when the volcanic ash cloud over Europe forced him to cancel plans to attend the funeral of Poland's president. 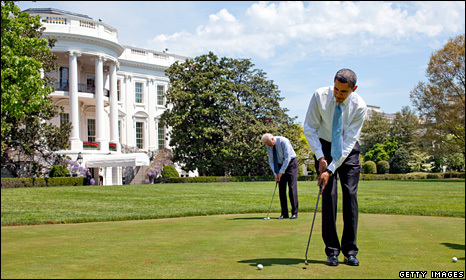 The golfing figures were compiled by Mark Knoller of CBS Radio, the unofficial White House statistician. Mr Bush, who played 24 times, was mocked for his fondness of the game. In an interview following the bombing of the UN headquarters in Baghdad, the former president was filmed on a golf course calling on "all nations to do everything they can to stop these terrorist killers", then pausing before saying: "Thank you. Now watch this drive." Mr Bush later gave up playing golf while in office, saying in 2008: "I don't want some mom whose son may have recently died to see the commander-in-chief playing golf. "I feel I owe it to the families to be... in solidarity as best as I can with them. And I think playing golf during a war just sends the wrong signal." Golf Digest has ranked Mr Obama eighth among the list of golfing presidents, behind Bill Clinton but ahead of Ronald Reagan, who was known for practising putting in the aisle of Air Force One. John F Kennedy, widely considered the best golfing president, took great pains to ensure he was never photographed on the course.